1 bedroom cabin close to fishing, hiking, mountain biking, and atv trails. 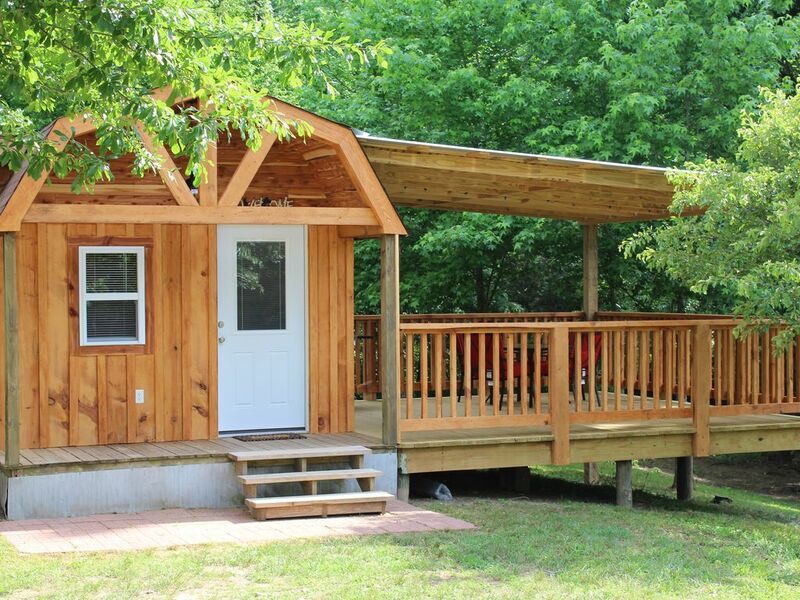 Nestled on a shady lot our cabin is small but well laid out to provide your family maximum enjoyment. We offer one large bedroom with a king size bed and one queen size sofa bed located in the living room area. Our cabin can comfortably accommodate four adults or two adults and two children. Fully stocked kitchen including coffee maker, microwave, convection toaster oven and more for your convenience. Bedroom and bathroom linens provided. Washer and dryer also included. Walk 600 feet to one of the most beautiful, crystal clear creeks. Bring your chairs to set up on the gravel bar, floats to lounge around on and your fishing pole to catch a few of the small mouth bass or bream that live in the creek. Relax, read a book or just spend time with family or friends on our large covered deck. Propane grill is provided so that you can grill those fish you catch in the creek! Centrally located to so many amenities for you to enjoy while on your vacation. Fish beautiful Lake Ouachita, ride the trails at Wolf Pen Gap, dig for crystals at one of the many crystal mines located nearby or enjoy the day canoeing one of the beautiful rivers or creeks close by. Paper towels, napkins, foil, trash bags, coffee, coffee filters, salt & pepper and oil. We offer enough to get you started!